It seems almost impossible that it is this time of year when we move indoors for our shooting. We have however, had a good summer season with favourable weather. Our last session at Sywell on Saturday 4th October was a fun shoot of Archery Crazy Golf led by Mick Lovell who did an excellent job of organizing the affair. The results are here. Wet morning weather gave way to drier weather just especially for the start of the shoot.The enjoyable game was followed by hot dogs and medal presentations for the season’s Target Days – overseen by David Stephens our Deputy-Chair. (results found here). 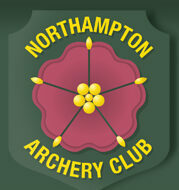 For the first year we have also presented Novice Awards for our promising and inspiring new archers. These went to Bailey Bridgewater, Hazel Dalley, Triv. McCarlie and Kelly Pearce. Bailey has shot well through the year and has represented NAC at some County Shoots, whilst the enthusiastic Hazel shot in all four of our target days. Her smiles are a lesson to the older archers who get a bit frustrated when things go wrong. Triv. and Kelly have both progressed really well with their shooting and we wish them well for the up and coming indoor season. Classification badges were awarded to Ryan Boot (2nd Class), Mark Dalley (3rd Class) Pam Joseph (1st Class), Heather Major (1st Class), Triv McCarlie (3rd Class (not present)) and Beryl Tabberner (3rd Class).